The title of this blog is the imagined way I’d hike in the sky if everything were upside down, inverted — the sky being the ground. This morning was one of those days where the light was a little flat (hazy/cloudy sun) on the fresh snow. It can be really flat when it’s snowing, too. 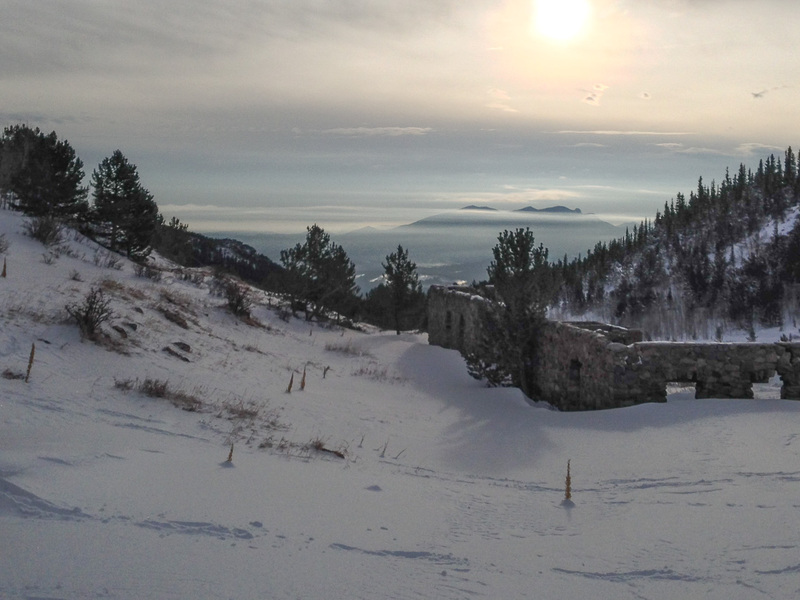 Sometimes when I’m snow-shoeing in flat light I can’t really see the snow. Instead I see only all white, with no depth. I take a step into the white not knowing where my foot will stop and touch something firm. There’s something surreal about it, like I’m not walking on the ground. The inverted sky. Hazy light of dawn, Mt. Thorodin in the back ground, the stone ruins of Caribou gold mining town in the foreground. A lot of snow has fallen since I returned from the deserts of Utah, much more than I’ve ever seen here at this time of year. But this is what I expect with a warming climate, the heavier snows we would normally get in spring will fall mid-winter when it’s usually just cold and dry. 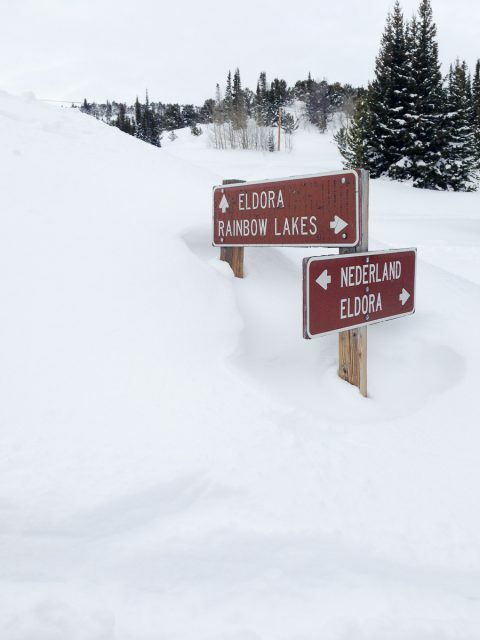 Which snowdrift should I go to? This morning, I endeavored to stay off any trails. When I’m walking on a trail, my mind wanders and contemplates things, often unrelated to the hike. This is good when trying to make a hefty decision about something. When I’m off-trail, I’m fully focused in the moment, path-finding, choosing where to go, especially in the forest. It can be exhilarating and gets me out of my head. I emerged from hiking in a fairly dark forest and into one of my favorite valleys. A lone coyote yipped and howled from the side of the valley, possibly as a simple greeting to me. It surprised me a little because coyotes usually head for lower elevations in the fall (I was above 10,000 feet). I can’t imagine a coyote hunting for showshoe hares in such deep snow. There were snowshoe hare tracks all over the place. 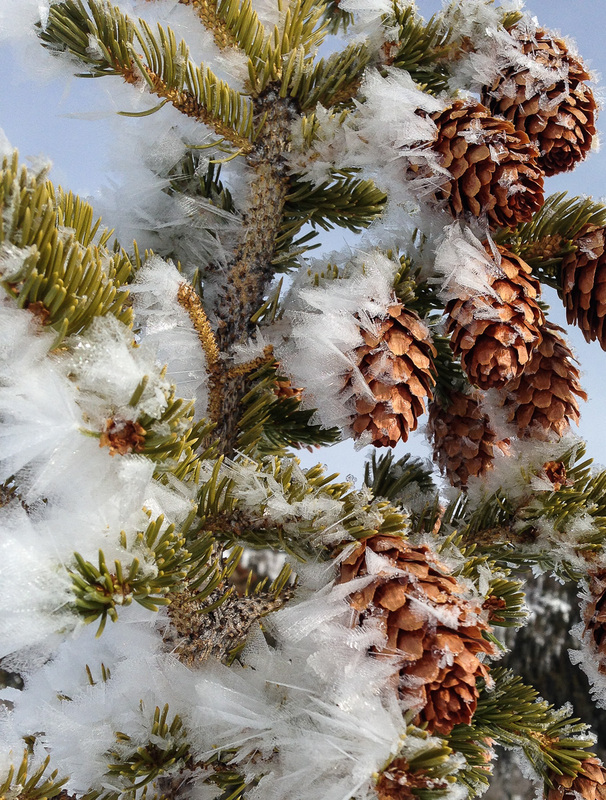 Another cool thing were these large feather-like ice crystals growing on the branches of the trees. The largest ice crystals I’ve ever seen, especially upper left in the shadow and lower center. Over an inch long (2-3 cm). Click for larger. They kind of reminded me of moth wings.